I have met the Devil, and one of his names is Cymbalta. It took me more than 8 weeks of slowly reducing my dosage to detox off 90mg a day of Cymbalta. The first 6 weeks were OK, but then came the long weekend from hell when I finally experienced the Cymbalta Detox breakdown that I knew was coming. Crying, shaking, repetitive thoughts in my head, feeling like I was going to explode at the slightest provocation; yep, I had it all. There was this hopeless gnawing feeling that I was going to have to go back on this drug, just to make the detox symptoms go away. I was taking super omega 3 fish oil and B12 to combat some of the side effects, but really I needed to go and see the doctor and let him yell at me for stopping the med, after which I would ask him for a low dose prescription of Zoloft to get me through the worst of it. 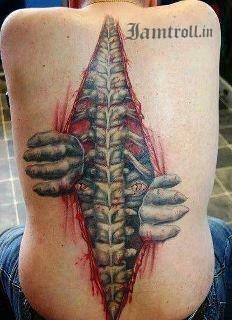 An amazing tattoo. This is how I feel most of the time, keeping the monster hidden within. Not only did my doctor scold me for coming off Cymbalta without his assistance, he also tried to convince me to get right back on that horse and ride it again at 60mgs. I felt like I was an elementary school student being chastised by the school principal for not following the rules. You have fibromyalgia, he said. You need to manage the pain and the anxiety, he said. You need to go back on Cymbalta, he said. It was good patient vs. naughty patient time. Should I just surrender and return to the enemy, or could I stand firm and look this guy in the face and just say no? What right did he have to insist that I return to a drug that has been holding me hostage for more than 8 weeks? What advantage was I gaining by returning to a medicine that was making me sleep all the time, crave carbohydrates, and giving me brain zaps? Every decision has pros and cons, but this one seemed like an easy one. I insisted on no more Cymbalta. I insisted on a low dose of Zoloft to manage the final detox and to stabilize my emotions. He tried to convince me to go on 200mgs right out of the gate. How is this good medical advice? 200 mgs of Zoloft is high – that’s like having a scratch on your knee and fixing it with a leg cast. Again, more words went back and forth between us. In the end, we agreed that I would take 50mgs because I knew I needed something, but what I did not need was an addictive tranquilizer which was turning me into an overweight zombie. In reality, as a doctor, he failed me. I needed to be told to make lifestyle changes, not take more drugs. He needed to tell me to lose 30 pounds, to exercise regularly, to get some support group or talk therapy for the anxiety, and to change my diet. Instead, he spent valuable appointment time trying to convince me to stay on a medication that I knew was doing me more harm than good. I ran out of pills one weekend, and I didn’t immediately refill my prescription. Within 4 days, I experienced a horrible break down of sobbing and anxiety attacks. As soon as I started taking the pills again, the symptoms went away. Same thing happened about 6 months ago when I didn’t refill the script right away, only this time the experience was faster and harder. A dark knot of fear formed inside the self-preservation core of my brain – why am I taking a medicine that makes me sick? I hadn’t been feeling well for quite a while, despite the 90mgs a day. Or was it because of the 90mgs a day? Could Cymbalta, which was supposed to help me quiet negative thoughts, keep my fibromyalgia from flaring up, and help me get through anxious experiences, be hooking me like a fish? Scared to get off it, scared to keep taking it. Thanks, big pharmaceutical drug companies. Thanks a lot. Fast forward to today. I am officially off Cymbalta and taking 50mgs of Zoloft. I am forcing myself to make lifestyle changes which will require a financial, physical, and time commitment to implement but which will benefit me more than a 1000 pills. I am going to hire a weekly house cleaner, sign up at the aquatic center so I can swim laps again, get monthly professional massages to help my aching small back, and try to take control of the anxiety demons in my head. In addition, I am going to finally set up automatic payments for all of my bills, as well as eliminate as much paper as possible from entering my home via mail and overflowing pocketbooks. I will continue to keep my journal, and I will force myself to find time to do the things I have pushed aside the past year, including writing and scrapbooking. All of these things are the right things to do – it will take a combination of external and internal changes to get to a place of peace. For the most part, I have the resources to accomplish these goals. I just need the motivation. Finally, I am motivated to feel better, and getting off Cymbalta was just the first step.